If you’re working with suboptimal storage or recently upgraded your workspace and find that you don’t have the same storage options that you had before, a file cabinet can really help. The 3-Drawer File Cabinet was designed to fit under our UPLIFT Desk models perfectly, so you can keep it stowed away under your sit-stand workstation. You’ll get your pick of file cabinets in black, gray, and white to suit almost any office style. Does this lock? How secure is it? We designed this locking pedestal to deliver more organization and security to workspaces. All three drawers lock via the top drawer, giving you a secure all-in-one storage solution where private items, purses, documents are kept safe and where you want them. What types of things will this hold? Pretty much anything! From letter and legal papers and folders to small desktop items like paperclips and tape. The top two drawers even come with a non-sliding, removable tray to organize small items, and the large bottom drawer comes with a hanging folder bar to adapt the drawer to letter and legal size hanging options. Do I have to assemble anything to get this ready for use? Getting your cabinet assembled and set up is easy, all you have to do is attach the casters. Your package will come with a collection of screws and a small wrench for the job, and most users complete this step in just a few minutes. 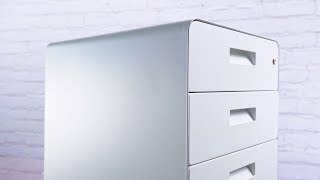 Not only does the 3-Drawer File Cabinet have three drawers, it also comes in three color choices - black, white, and gray. When your desk is overflowing with books and papers, clean it up with the 3-Drawer File Cabinet that can be stowed away under your UPLIFT Desk.